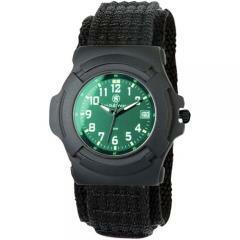 The Smith & Wesson Lawman is a rugged all-black tactical watch designed for extreme toughness and easy reading. Its 40 millimeter stainless steel casing resists shocks and impacts, and comes equipped with a strong, wear-resistant nylon strap. The watch is built around a precision-engineered Japanese quartz movement that provides accurate timekeeping capabilities and rarely requires readjusting. It includes hour, minute and second hands and a date counter. The black display is electronically backlit for enhanced readability in low-light conditions, and features luminous strips on the hands, numbers and markings to make them more visible. The first watch I received had a broken face. A call to CopsPlus customer service had a replacement watch on its way (4 stars). The second watch was received and worn for a week. In that time it never keep time accurately. I had to adjust the time forward by 15 minutes at least once a day. If a watch cannot keep accurate time, its basic function, it is useless no mater how cool it looks or how good the deal was. I am a huge Smith & Wesson fan but who ever earned the right to put the S&W name on its watch should be dropped from their list of suppliers. Kudos to Cops Plus for great customer service. Zero stars for this product. Great watch, The stitching on the band is coming out but does not seem to be hurting the band. Not sure if it's just left over string. Very comfortable and easy to read day or night.